Height 5 feet 10 inches. Weight 168 lbs. Chest measurement 34-38 inches. Complexion fair. Eyes blue grey. Hair fair. Sight normal. Hearing good. Colour vision normal. Limbs well formed. Full and perfect movement of all joints. Chest well formed. Heart and lungs normal. Teeth good. Free from hernia, varicocele, varicose veins, haemorrhoids, inveterate or contagious skin disease. Vaccinated. Good bodily and mental health. No slight defects. No fits. No illness. It was at Pleasant Point that he played for the local football team in his youth. In 1909 he was one of the company of Pleasant Point amateurs who gave their first concert and adopted the nickname "The Cats" (the initial letters of the Canterbury Amateur Theatrical Society). The company was congratulated on having such promising talent and attracted about 200 people to their very successful performance. By 1911 William had moved to Dunedin where he worked firstly for a grocer at Caversham and then as a commercial traveller. In May 1911 he incurred a fine for leaving a horse unattended in George Street. Come 1915 and William, already serving with the Otago Territorials, volunteered for service and left Dunedin by special train on 13 February, as one of the Otago quota of the fifth reinforcements. They were headed for Trentham to undergo training before leaving for the front. The departure of the Dunedin men worked with "true military precision", even with thousands of people gathered to see them on their way. After falling in at the Garrison Hall, the troops marched to the Queen's Gardens where the Union Jack and other flags were floating proudly. The Mayor in his address, said "You are going forth to help the Empire in the very important duty she is now engaged upon, and we are here as citizens of Dunedin to bid you farewell and to bid you God-speed." Mr G. W. Gibson, the chairman of the Chamber of Commerce, delivered a very eloquent address, in the course of which he said "they were going to take part in a war to uphold the very foundations of civilisation and liberty." Bunting was displayed on many of the buildings along their route to the station, and the good wishes of all were clear. Corporal W. J. Gliddon was promoted to lance-sergeant in June 1915 at Trentham. He left for Suez with the Otago Infantry Battalion on 13 June 1915, and for France in April 1916, after being promoted to sergeant. Sergeant William John Gliddon was reported missing, believed to be killed on 14 July 1916. 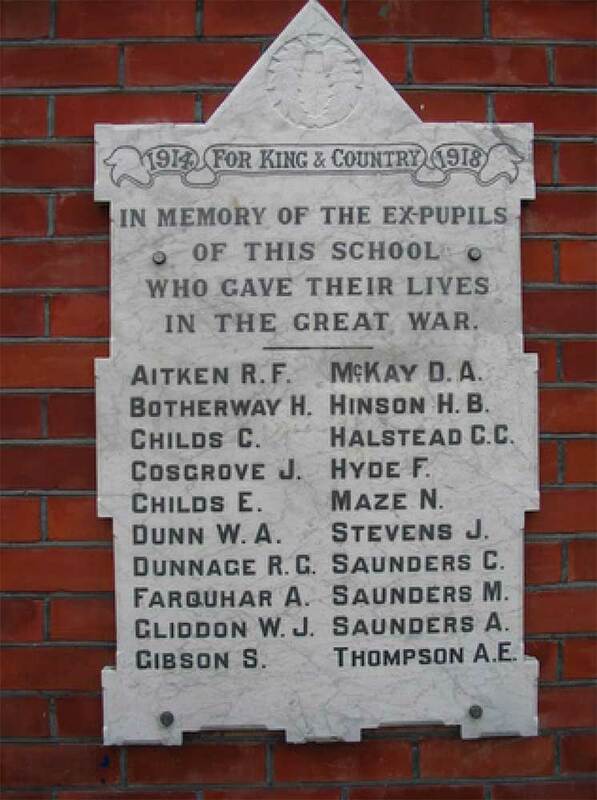 Just over a week later it was reported that he had indeed been killed in action on 14 July, which was noted by the headmaster of South School at the August 1916 monthly meeting. Mr James Gliddon also received official word of his son’s death and that he was buried in the Cite Bon Jean Cemetery. His family published a Thanks notice in the Timaru Herald of 17 August 1916 – “for expressions of sympathy in this their sad time of sorrow and suspense, caused by the report that their son was killed in action in France”. Probate in the estate of William J. Gliddon was granted in the Dunedin Court on 20 November 1916. William had drawn up his will as he was about to leave New Zealand with the Expeditionary Force. He directed that all his estate real and personal be held by his trustee for his mother and, if she should die before, his four brothers and only sister. His medals (1914-15 Star, British War Medal, Victory Medal), plaque and scroll were all sent to his father in Timaru. His family inserted an In Memoriam notice in the Timaru Herald of 14 July 1917 – “Where duty called, or danger, he was not wanting there.” And in subsequent years their youngest and dearly beloved son was faithfully remembered – 14 July 1917, 15 July 1918, 14 July 1919, 14 July 1920, and on the 14 July 1921 "Till the Resurrection Morn"). William's name is also inscribed on the tablet in memory of ex-pupils who fell in the great war, which was unveiled at Timaru South School on 18 September 1919 in a memorable and unique ceremony. "No nobler boys had left the shores of New Zealand than ex-pupils of the Timaru South School," said one long-term committee member. A casualty of the Somme campaign, he is remembered too, on the Timaru War Memorial Wall and the Pleasant Point School Memorial.